Well, we’ve come half way around the world and ended up in Tokyo – yokoso! (Welcome!) I’ve been here now for just over six months and I’ve only managed to scrape the surface. The short and sweet “Tokyo” does nothing to prepare you for this non-stop, hustle bustle, bright lights, big city. It’s mind-blowing, and the food opportunities are endless… This is simultaneously thrilling and terrifying for someone like me. Coming from Sydney, Australia, where it was enough to follow the foodie grapevine buzz, trying to navigate the Tokyo foodopolis was a daunting task – until I discovered Foodspotting. For the *Rolls eyes* “Oh, that’s so 2011” of you amongst us, please excuse my sloth-like* slowness – I spent most of that year strapped to a backpack. If, however, you’re hearing about this for the first time, download the app immediately! Pronto! I’ll wait. Now, where were we? Right – Tokyo. So, last weekend, Yoshi (food partner in crime) and I step outside of our front door, with Android in hand. Foodspotting does its thing and comes up with a delicious-looking bowl of soba 200 metres away. We set off and in minutes arrive at Fujita – a grandma and grandpa op, hidden away in the back streets of residential Honmachi. And boy, can grandpa cook! His food was AMAZING. Yoshi ordered Foodspotting’s Mori Soba – cold noodles, tsuyu (dipping sauce made from soy sauce and stock), wasabi and finely sliced spring onions – the soba gold standard. I veered off-course and ordered soba with warm tsuyu, duck and citrus peel. The noodles were thin, chewy and speckled grey; the tsuyu was the perfect antidote to the frosty February weather. We also shared a Dashi-maki-tamago (Japanese omelette seasoned with stock) and finished our meal off with a small bowl of soba yu (the water the noodles are cooked in) flavoured with leftover tsuyu. I’m a big soba enthusiast – I think it has something to do with the Zen-like balance, simplicity and cleanliness of the meal, not to mention the countless health benefits of buckwheat! And while I’m no soba officiando, I can pick the so good from the so bad. Fujita’s soba was sooooo good! We’ll definitely be going back for more. So, thank you Foodspotting! Where to next? 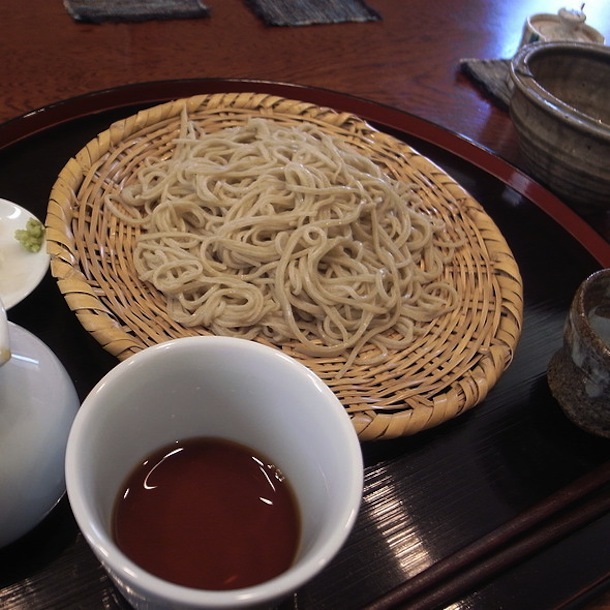 Soba tip: The best way to eat soba is cold with a separate sauce for dipping. This way the soba maintains its texture, which is really what it’s all about! *Apologies for the totally random sloth video but it’s just so hilarious – I couldn’t resist! This entry was posted in Taste, Tokyo and tagged natalia, taste. I so look forward to Foodspotting in Tokyo with you and Yoshi some day soon!! Itadakimasu. @Lauren: Oh yes, please do! Tanoshimi!! My mouth is watering from just looking at the photo. Looking forward to more Foodspotting posts from Tokyo! Fujita soba sounds a lot better than Fuji soba… Yum!